A Burning Question: May I Bring Alcohol on My Cruise? One of the most popular questions we’ve encountered about cruising is “may I bring alcohol on my cruise?” Since each cruise line has a different alcohol policy, the answer isn’t as simple as “yes” or “no.” To alleviate confusion, we’ve decided to break down the alcohol policies for each cruise line. Azamara Club Cruises Yes. 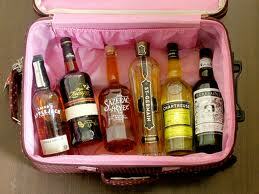 Liquor, beer and wine are allowedfor private consumption in suites or staterooms (two bottles per stateroom). Consuming alcohol in any shipboard restaurant, bar or dining venue, is subject to a corkage fee of $10 per bottle. Note: Wine is served during lunch and dinner, and is included in your cruise fare. Carnival Cruise Line Yes. One bottle of wine or champagne per person is allowed on embarkation. No beer or hard liquor may be brought on board for consumption. A $10 corkage fee per bottle applies for consuming in the main dining room, $14 at the steakhouse. Celebrity Cruises Yes. Two bottlesof wine per stateroom are allowed on embarkation, subject to a $25 corkage fee per bottle when consumed in public areas. No beer or hard liquor may be brought on board for consumption.